Selling a home is often about more than just moving a piece of real estate--it typically reflects a major life transition. Maybe you are a senior couple looking to downsize, a young family needing to expand, or a family having to sell your parents’ home. Whatever your situation, I will work diligently to understand your goals and design a plan that not only lists and markets your home, but helps you achieve your specific needs. I study the current market continuously and will prepare a market analysis of your home that references the best pricing strategy and shows how we can maximize your sale. Every home sale I do includes a customized marketing plan that presents your home in a way sure to gain the highest level of interest. 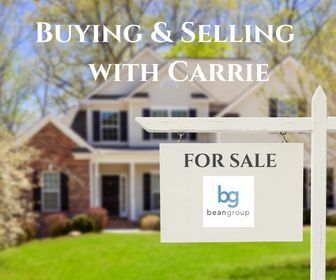 I offer a number of unique services that give sellers an added edge in having their homes sell quickly and successfully. I promise to guide you from “Just Listed” to “Sold” as efficiently as possible, and pride myself on giving my clients the best in customer care. * Masterful Marketing. Owning my own businesses has given me an extensive marketing and advertising background. When producing trade shows, I oversaw everything from advertising to live television remotes, print pieces, radio, social media, and sponsorships. I made sure our brand, image and look were consistent and perfectly presented. I will present your home with the same diligence and comprehensive approach. My experience in event planning and management has proven invaluable when it comes to presentation, attention to detail, and capturing a buyer’s interest in terms of showcasing your home. * Social Media Savvy. I have extensive experience in social media, have taken classes in the field, and successfully launched a business that way! I guarantee there will be positive buzz about your home! * House Beautiful. I am a certified home stager and will work to beautifully stage your home. I also bring in an interior designer for a free consultation. The right presentation is proven to capture buyer interest and help maximize your sale price. * Your Customized Website. When you list a home with me, you get a customized website (along with a comprehensive marketing package) that showcases your home’s best features and pricing. * Clean Counts! Showing a spotless home to potential buyers definitely boosts its impact and the amount of interests it generates. To ensure that your home is at its best, I treat my clients to a free top-to-bottom cleaning. * Local Knowledge. Because I know the area, I know how to make your home stand out and where your best market potentially lies. * Personal Passion. My entrepreneurial spirit drives me to succeed--and that means I am completely motivated to sell your home! * On Trend. I stay up to date on the real estate industry in general and especially trends here on the Seacoast. * Working Together: I am very good at representing people in a professional manner and negotiating. I have worked as a mediator and am experienced with handling major contracts. I love bringing people to the table and getting everyone to an agreement that we all feel good about. I love working with buyers to find the perfect property to call home! There is nothing more rewarding then helping someone find that special place to call their own, whether they are seeking a first-time home, are new to the area, or are transitioning to a different lifestyle. Whatever your needs, it is important to work with an agent who is an expert in the local real estate market. My extensive knowledge of real estate in the Seacoast Region will be invaluable in helping you find the home and neighborhood that suits you and your family. Please rest assured that I will not only help you find your perfect new home, I will also be right beside you throughout the buying process--from discussing your goals to researching options, negotiating, and helping you achieve a successful closing. As an experienced landlord myself, I work with property owners to find qualified tenants for their investment properties. I put the same focus on your property rental as I do on properties that are for sale. Professional photos are taken for all rentals and I make sure the locations are presented at their best. Image is everything, and presenting property well is key to finding a good tenant to lease your property.